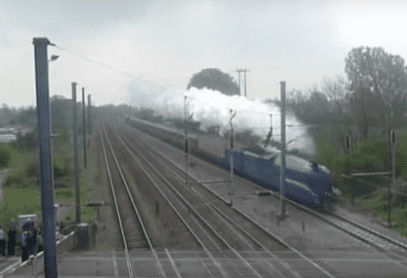 A blast from the past: long-scrapped A4 Pacific No 4492 Dominion of New Zealand has returned – and is seen speeding through Tallington crossing on the East Coast Main Line on 16 April with the first leg of the Railway Touring Company’s ‘Great Britiain IV’ marathon eight-day trip to Scotland…. The locomotive is in reality No 60019 Bittern, which has been converted and repainted with the addition of valances, by its multi-millionaire owner Jeremy Hosking. The full story of the conversion of Bittern and an in-depth feature on Britain’s fastest steam locomotives in their most illustrious livery is featured in Heritage Railway issue 149.